Bior Shin began life in hyperspace along the Hydian Way during a trading mission to far off Utapau. The first tattoo on his infant head was the mark of the traveler, the star child, and the spacefarer. His family owned various ships and was known to trade goods with systems throughout the galaxy. Bior was enamored with space travel, and would often go on voyages with his Uncles and family friends. Mirialans considered him a good luck charm, attuned with the Great Force and therefore a valuable asset when navigating the Hyperspace lanes that connected Mirial to the rest of the galaxy. Everything changed after an extended trip to Coruscant. His uncle’s ship, Hylo’s Pride, was attacked by Pirates, who were disenfranchised members of the now defunct Shadow Collective. The head of this band of pirates was none other than Krexus Pyke, one of the last interstellar bastards to bear the name. The pirates boarded the ship and attacked ruthlessly, killing anyone who got between them and the ship’s cargo. Bior was put in the cargo hold along with the civilians while the Mirialan security engaged the pirates. The battle did not go well, and soon the pirates were breaking down the door to the cargo hold. As the pirate leader stepped into the hold, an old Mirialan man stepped between the pirate and the women and children in the hold. 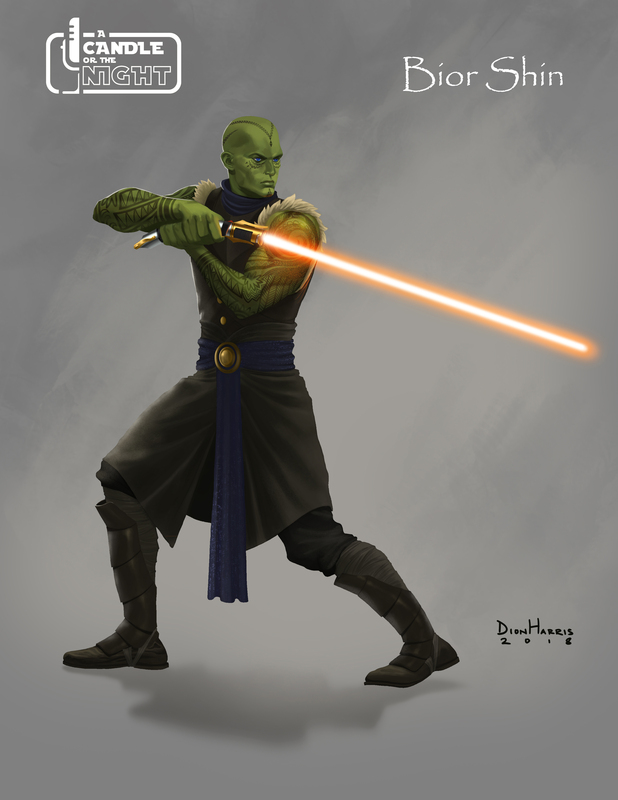 His name was Dre’Tak Offee, and his face was tattooed so much that barely any of his green skin showed through. “You’ve come far enough.” It took a few seconds for the pirates to stop laughing. With a violent shove, Krexus pushed past Dre’Tak and made for the civilians. “The Empire is dumping credits on anyone who brings in a force sensitive kid. You greenies are particularly prone to having them, so if you don’t mind, we’re taking your little runts on a trip. Please feel free to resist.” The smile on Kerux’s face said it all. He grabbed at the first child and pulled him from his mother’s arms. The wailing mother tried to fight but was punched down and kicked by the pirate. The remaining pirates went to work, pulling screaming children from their parents and laughing the whole while. They turned to go, blades bared and blasters out, when a lone figure blocked the entrance to the hold. Krexus stepped up to the youth at the door, a youth that was too young to be a man, but too old to be a child. “You’ve come far enough.” Krexus calmly reached down to pull out his blaster and shoot the kid, but he grossly underestimated two things: the youth’s determination and speed. Without any hesitation, Bior reached over to the pirate’s other hip and pulled the man’s vibroblade from its sheath. In the next instant, he slammed it into Krexus’s chest and pushed him back into the men behind him. In the 3 seconds it took for his men to react, Dre’Tak was able to pull another pirate down, take his blaster, and eliminate the remaining 3 pirates. Bior turned around as the remaining pirates exited the lift. He saw the looks on their faces when they saw Krexus and his men on the ground, dead. They turned tail and ran. 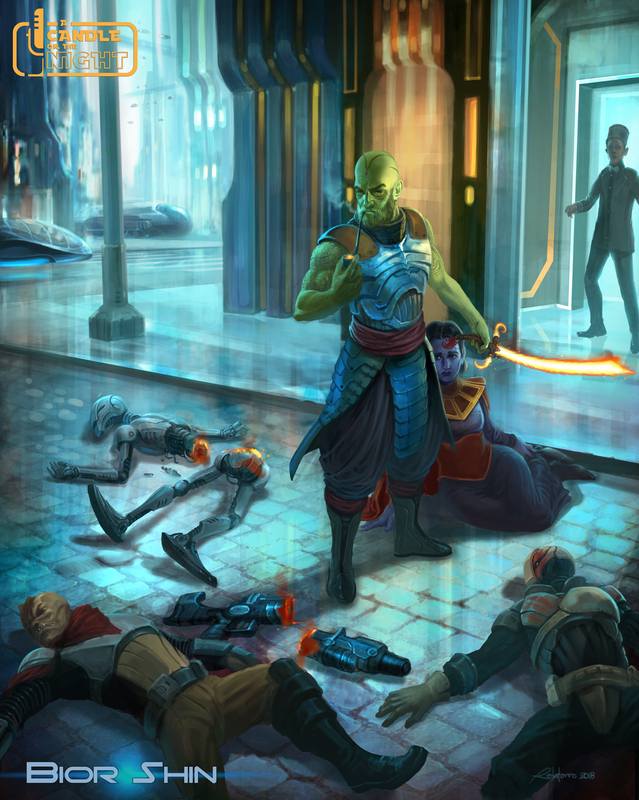 It turns out that Dre’Tak was a Military advisor during the Clone Wars and the head of the Mirialan Ambassador’s security detail before his retirement. He offered Bior a position among his men, going so far as to make him an honorary member of his lineage. Bior the Traveler became Bior the Guardian, and for the next couple of decades served all kinds of Mirialan dignitaries and political leaders. He trained relentlessly and was known for his unwavering loyalty and dogged persistence. He stopped at least a dozen assassination attempts, and to date he has never let anyone in his care come to harm. In many spaceports, Bior has a reputation that precedes him, and although he doesn’t shy away from his moniker “The Star Guardian”, he prefers to go by Bior.